If you need a visual image to keep you focused on your Lenten journey you might consider the Italian Renaissance artist Pinturicchio’s Allegory of the Hill of Wisdom (1504). The Greek philosophers Socrates and Crates are caught in a rather tricky balancing act on the top of a steep hill with the Roman goddess Fortuna. A desperate band of travelers are shown trudging upward on a difficult path, supposedly a path we humans have to undertake if we want to reach wisdom. Siena is one of my favorite cities in Italy, a UNESCO World Heritage Site and a must see when traveling in Tuscany. Siena is located in the Val d’Orcia, a breathtakingly beautiful part of Italy that makes the journey all the more memorable. A perfect image in my mind’s eye to reflect on life’s journey. Pinturicchio’s travelers to the Hill of Wisdom find their fortunes cast from the top as if to say Fortune is fickle and Wisdom lies in knowing so. Vin Santo is Tuscany in a glass and reflects Tuscan life at its best; life that is meant to be savored not saved and lived to the fullest. Because of its name Vin Santo (wine of the saints) was thought to have originated as a sacramental wine. However there are other accounts that link the name to historical references that are less ecclesiastical. 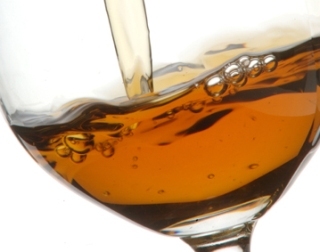 There are 2 types of this rich, amber colored medium sweet to medium dry wine typically enjoyed as a dessert wine at the end of a proper Italian meal. One is made entirely from white grapes (Malvasia or Trebbiano) and one from red varieties (Sangiovese, Canaiolo , Malvasia Nero). The latter is known as Occhio di Pernice because of a shading of redness reminiscent of the “eye of a partridge” for which it is named. The fermenting of Vin Santo can be described as nothing short of meditative. 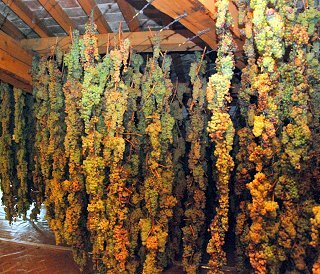 Grapes are hung to dry in vinsantaie, a large ventilated room with many windows. The windows in the room are opened and closed to control the flow of air. Here the grapes are subjected to seasonal temperature changes which create a unique taste and texture to the wine with hints of raisins, dried fruit and the bouquet of Tuscany.